Jobs Description of Accountant - Analyzes financial information and prepares financial reports to determine or maintain record of assets, liabilities, profit and loss, tax liability, or other financial activities within an organization. This career is part of the Finance cluster Accounting pathway. Prepares, examines, or analyzes accounting records, financial statements, or other financial reports to assess accuracy, completeness, and conformance to reporting and procedural standards. Reports to management regarding the finances of establishment. Establishes tables of accounts and assigns entries to proper accounts. Maintains or examines the records of government agencies. Advises clients in areas such as compensation, employee health care benefits, the design of accounting or data processing systems, or long-range tax or estate plans. Accounting Systems Analyst - Integrates knowledge of systems analysis and computer application systems and has responsibility for coordinating the modification and implementation of a full range of financial accounting systems, including large, complex, countywide systems. Public Accountant - Performs many functions, including auditing financial statements, designing financial accounting systems, assisting in the managerial accounting function, providing managerial advisory services, and tax preparation. May perform services for corporations. 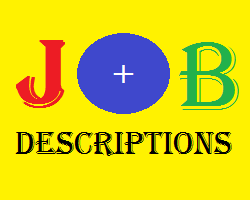 Belum ada Komentar untuk "Jobs Description of Accountant"